This is the icon representing the Terrorist team. This is the icon representing the Spec Ops team. Shows the stamina you have remaining. Running, jumping etc. require and use stamina. Resting or walking will restore it. Shows the damage you have sustained, also indicates what body part was effected. The colors run white for excellent health through yellow orange and red, respectively. Indicates your current posture: standing, crouching, or prone. Indicates your current fire mode (weapon dependent) Includes : Full-Auto, Burst, Semi-Auto and Pump. The left icon indicates an ESTIMATE of the ammo remaining in the magazine currently in you weapon. The right icon indicates the number of magazines you have in your possession for the weapon you currently have in your hands. The bomb has been planted at this objective, Spec Ops must defuse; Terror must defend. Shows the location of a dropped bomb if carrier has been killed (Terror only). TC:E offers three totally independent gametypes with separate UI's (which from now on will be referred to as TC:E Mods). Each of these mods, being Objective, Bodycount and Capture the Flag (based on Reinforced Objective game logic), share TC:E's realism core engine and art assets. 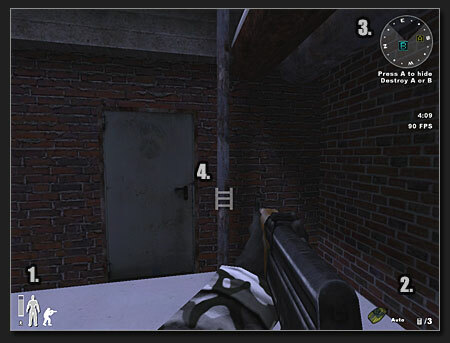 TC:E's development is focused on the Objective mode - with all aspects dedicated to tactical realism. Along with our to-scale mapping and the to-scale realistic movement speeds, we hope to offer an unique and outstanding gaming experience. The "Armament Availability" (AA) system is a rewards system, based on individual player preformance (no buying weapons! Yay!). What makes it somewhat unique is that it doesn't offer greater advantage to the more skilled player, only greater variety in available weapons. At the end of each round your score dictates what your AA points will be for the next round. When a new match begins all AA points are reset.